Dr. Libby Berg is a licensed chiropractor who graduated from Northwestern Health Sciences University in Bloomington, MN. Prior to completing her Doctorate of Chiropractic, Dr. Libby received her bachelor’s degree in Nutrition Science from the College of St. Benedict in St. Joseph, MN. 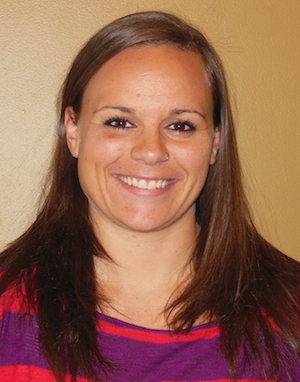 While she loves helping people of all ages, her true passion is sports medicine and rehabilitation, from the weekend warrior to the avid athlete. Because of her background in nutrition and her life-long dedication to exercise, Dr Libby’s focus in treating patients is to promote balance within the body through innovative chiropractic technique, soft tissue work, rehabilitation/exercise, and nutritional support. Dr. Libby’s love of sports began early in life when she started on a competitive swim team at six years of age. She proved a jock-of-all-trades through school, playing basketball, softball, and soccer. Competitive swimming remained her focus until a shoulder injury forced her to break. In her first year of college, Dr. Libby found a new love in rugby, and re-aggravated her shoulder injury. It was at that time that she first consulted a chiropractor, and her life was never the same. It became Dr. Libby’s passion to enable others to refine their own awareness in caring for their bodies. She’s taken her love of chiropractic around the world completing a wellness externship in Christchurch, New Zealand. When Dr. Libby isn’t working in the clinic, you can probably find her lifting weights or playing rugby. She currently plays for the Minnesota Valkyries. In addition, Dr. Libby has played for Midwest Select team, represented her country at the national level, and is currently pursuing her dream of playing for the USA Eagles in the next World Cup. She is also the Minnesota Youth Rugby head coordinator, and is currently developing youth rugby programs for kids of all ages around Minnesota.